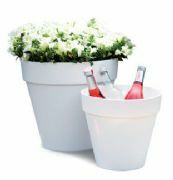 Because of its classic shape, the doppio flowerpot is a true eye-catcher in every garden. 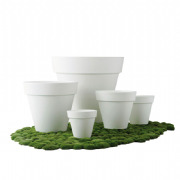 The pot has a natural land soft appearance due to the combination of plastics and wood fibre. This also means that it has all the advantages of a plastic pot. It is very easy to move, doesn’t break when you accidentally knock it over or drop it and is frost resistant up to -40°C. 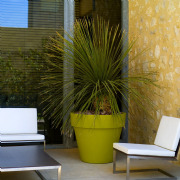 This beautiful pot can be enjoyed for many years, either inside or outside your house, and can be combined with other pot-sizes from the allure doppio collection. If you would like to use this planter outside, don’t forget to open the pre-drilled holes in the bottom. This allows the superfluous water to drain so the plants will not rot.